“Vous avez dû attendre pendant longtemps ?” (Did you have to wait for long?) my parents asked. We were standing at one end of terminal E in Roissy Charles de Gaulle airport, hugging and kissing. My parents were as eager to see us as we were to see them. But I knew that, in fact, they were even happier to greet and hold their little grand daughter. Lulu was snuggled cozily against my stomach in her ergo. We could only see the top of her head and hair and eyes which she had wide open. She was smiling and flapping her bare legs against mine, turning her head to the right, then to the left, not to miss anything that was happening around us. We were all tired but so happy to be home in France. The thought of traveling back home had filled me with feelings of excitement even if I had worried about our journey to Europe. It was Lulu’s first transatlantic flight. How would she handle it? Would she be fine with the many plane rides, between Boston, Paris, Dublin and Paris again? How would she do with the jet lag? But our little Lulu didn’t mind at all any of it. In fact, she adjusted extremely quickly, much faster than P. and I did. 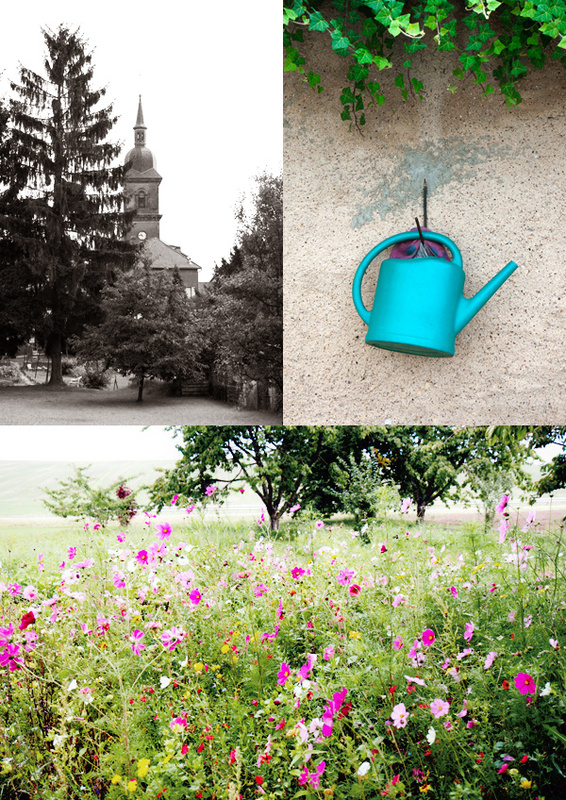 Summer in rural eastern France, where my parents and brother live, has left me wonderful memories. I realized that it had been years since I had traveled there during summer. It’s the soft morning light cast on the countryside early in the morning, the colorful wild flowers illuminating the fields, the rich smell of freshly cut grass, the butterflies dancing from flower to flower and the clacking sound of the crickets late at night that I love. 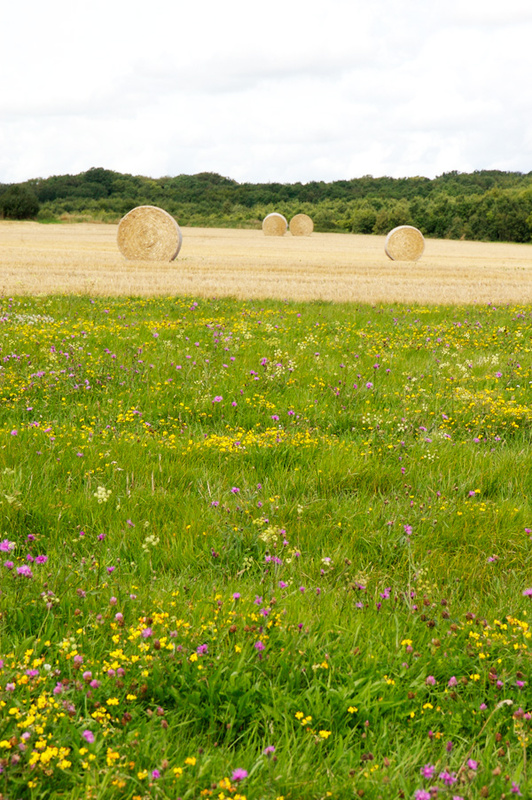 It’s the time of year when, I remember, as a young girl, we used to harvest hay at my grandparents’. Sometimes, I was allowed to drive the tractor back from the fields, and proudly did so. Later in the afternoon, my brother and cousins would sneak in the barn to play, jumping on bales of hay neatly stacked high. 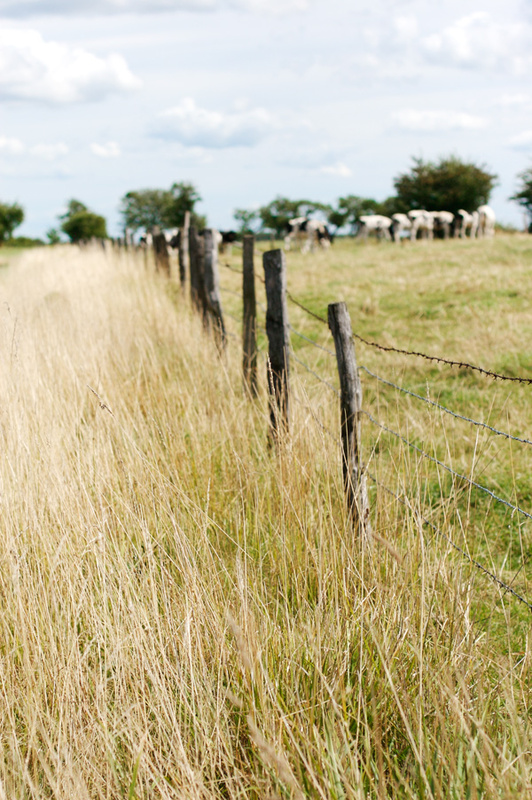 Days in the countryside are spent at a slower pace even if summer means it’s a busy time for many who live there. In my family, we like to pick all sorts of fruit to make jams and preserves and bake tarts; we preserve French beans and beets, and make ratatouille. We walk in the grass bare foot and nap under the cherry trees, if we feel like it. We did that very well, I must say, the day after we arrived, then the next, and the day after the next too — and we never seemed to find the activity boring. Would you? Lulu, too, made the place her own. She and I loved the daily routine we established. There were the usual morning and afternoon naps, the walks to the village to buy baguettes for lunch, and the many hours spent playing on a large blanket spread under the trees, in my parents’ garden. It was delightful to see her enjoy herself so much. She was fascinated by trees and loved to watch the wind move their leaves. She played with the flickering shadows created by the rays of sun filtering through the branches. I told her about where our food comes from. When I took her to the village, I showed her the cows and sheep and chicken and rooster and rabbits. I pointed at eggs nested at one corner of the hen house. I made her smell red currants and apples and strawberries and plums that my parents grow. She ate the vegetables — carrots, beans, zucchini, beets and tomatoes — we prepared from my mother’s and brother’s gardens. Every day, it seemed that she was learning something new — her new discovery is to clap her hands (she does that so joyfully, really, it’s cute!) while blowing raspberries at the same time. It’s amazing, actually, how quickly she has changed over the course of these last three weeks away. Our life is so much richer with her at the center of it. While falling asleep, I could hear them *converse* with each other in the kitchen at the breakfast table — Lulu sitting in her high chair while my mother was eating her bowl of muesli and yogurt. It didn’t matter that we did not travel long distances or do much. We did what we had been craving for weeks: we rested. The food was gorgeous, and I ate a ton. I even wonder where I put it all! 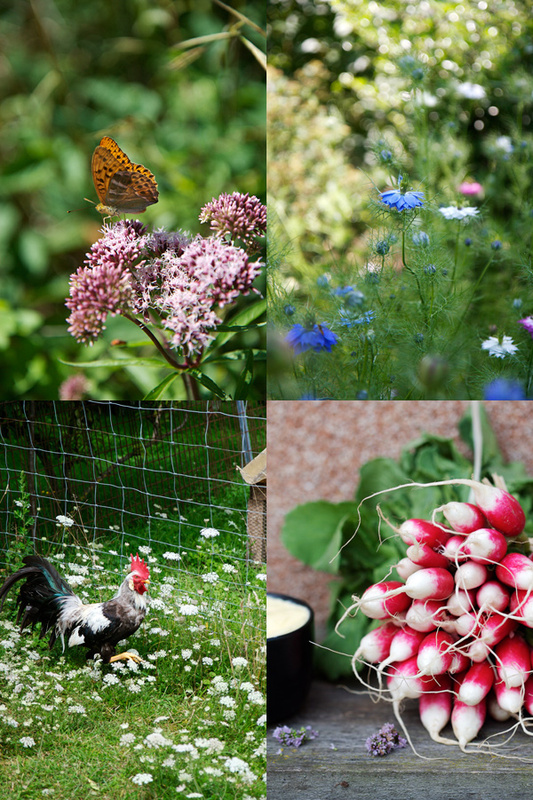 Between the fresh vegetables and fruit from the garden, I also indulged in dairy products hungrily, eating yogurts, petits-suisses and fromage blanc as if I was discovering them for the first time again. I devoured cheese greedily, at all times of the day. Oh yes! Everything felt more tasteful and flavorful. My mother cooked — isn’t this the nicest? — and I helped, baking and making fruit tarts. Every day, Lulu came with me to the garden where I picked more berries and seasonal fruit, carrots, salad and tomatoes for lunch. 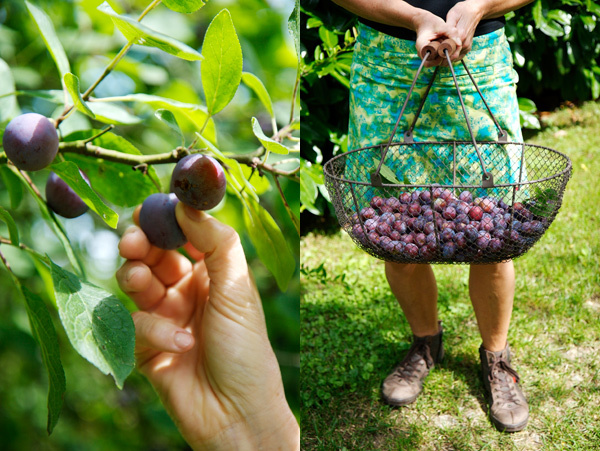 The mirabelles, prunes de cochon and quetsches were so ripe that we stewed them and made tarts. One day, my mum and I took Lulu to the local market. In my brother’s garden, I collected fresh herbs, different types of basil, sage, thyme, chervil, livèche (lovage) — my sister-in-law’s favorite — and mint to make a herb risotto. I’ll have to tell you about it. We enjoyed it so much that I cooked it twice. 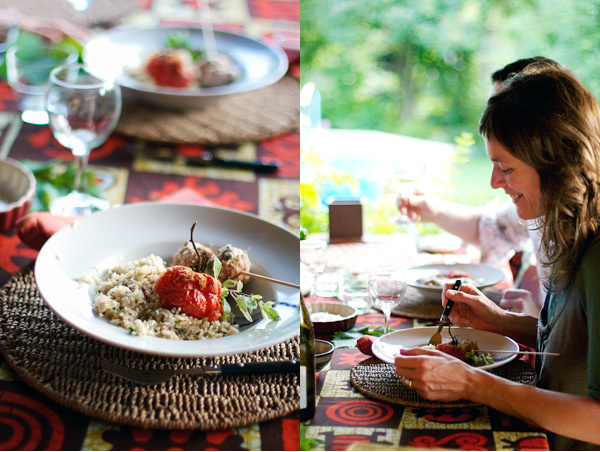 We had family lunches and dinners at home that we ate outside and a few times, we drove the scenic winding road, just a few kilometers away, to l’Ecluse 16 — a lovely restaurant nested in the Bonne Fontaine forest, by the canal de la Sarre — where we ate scrumptious modern food. I thought I wouldn’t find red currants, as suggested by my dad, but I was excited to discover that the bush in my parents’ back garden was still heavy with bright red berries, fully ripe. Every day, my mum used them in fruit salads while I baked them in muffins. I also made a red currant and almond tart. Red currants are a delicacy in the US, which always surprises me when they are so abundant and easily found where I am from in France. 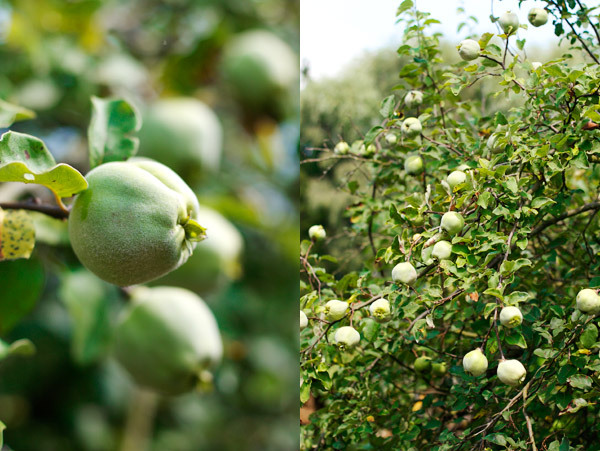 In the city of Bar-le-Duc near by, locals use the fruit to make a special jam. The tradition consists in removing the seeds with a goose feather and dates back to 1344. The jam is extremely delicate. 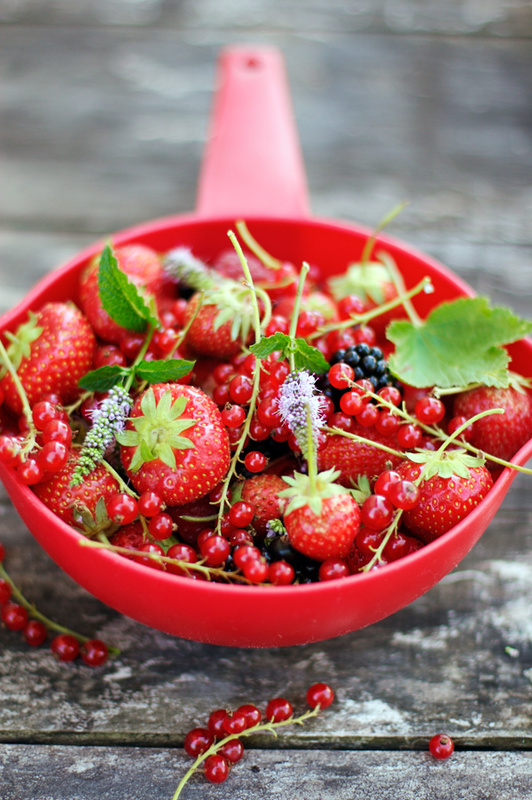 If you’ve eaten the berries before, you know that the fruit is rather acidic, and has small seeds inside. The berries are delicious in tarts when they are prepared with a sugary almond batter, which balances the tartness of the fruit. “I told you it would be worth it,” I told my dad, with a victorious look on my face, when we all sat down at the table again to have dessert. He had jokingly asked that I stopped stealing the last red currants on the tree. It was hard to! One of his favorite thing is to pick and snack on the fruit while working outside. “Oui, elle est très bonne ta tarte,” (Your tart is really good) he said, helping himself to a second slice. What I didn’t tell him is that, a few days later, I grabbed another handful of the red berries to bake muffins. I just couldn’t resist. Everyone commented on how delicious the muffins were. And the missing red currants went unnoticed. It’s wonderful how that works. In a bowl, combine the brown rice and quinoa flour. Add the cornstarch and pinch of salt. Add the butter and work with the tips of your fingers to make coarse crumble. Add the egg and work until combined and the dough forms a ball. Wrap in plastic and place in the fridge for a few hours, or overnight. Preheat the oven at 400 F. Bring the dough to room temperature before rolling. Garnish the molds and make small holes at the bottom. Cover with a piece of parchment paper and dry beans. Prebake the crusts for 15 minutes and remove the parchment paper and beans; let cool. In a bowl, beat the eggs with the sugar until light. Add the almond meal and cornstarch and vanilla seeds and continue to beat. Add the red currants and combine. Divide between the tartlets and bake for 25 minutes to 30 minutes at 375 F, or until the top is golden in color. Let cool and serve with dusted confectioner’s sugar. Without a doubt one of the most beautiful posts I have ever seen. Lulu is growing so quickly.You look lovely:) The photos..are beautiful. Vous avez eu des vacances vraiment sympa! Les photos sont comme d’habitude superbes, j’attends chaque nouveau ‘billet’ avec impatience et je relis les anciens avec grand plaisir. Such beautiful images Bea. I wanted to cry it made me miss my hometown and family so much. It’s wonderful that Lulu was able to spend time there and see your family and where food comes from like you said. Just amazing. C’est la première fois que je laisse un com’ pourtant cela fait quelque temps déjà que je lis votre blog. Vos photos sont magnifiques et on sent bien le calme, le repos, les vacances et la vie de famille …c’est tellement doux ! Oh my goodness – one shot more gorgeous than the next. a great way to start my day. 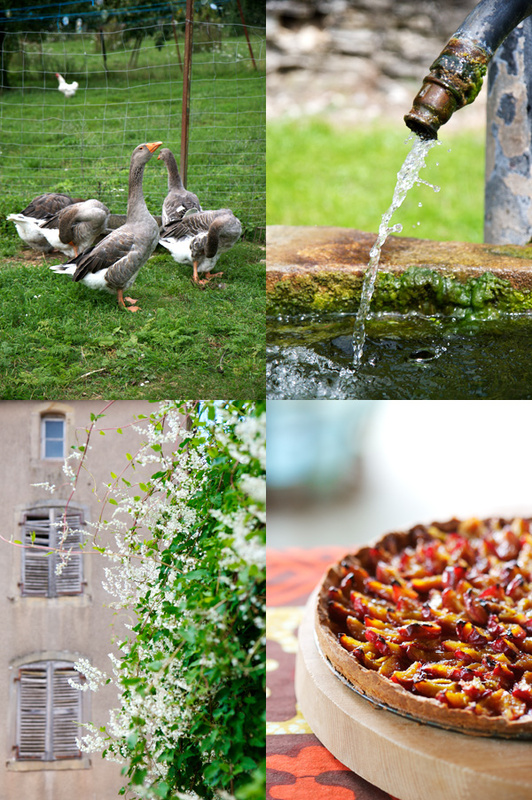 What a lovely post – it made me quite homesick for France! The food, the land, and the company all look divine! Bonne fin d’été! What a gorgeous post! I’ve never seen currants anywhere around here, though I imagine they have to be somewhere. I wonder if I can use raspberries instead? I so feel as if I’ve just witnessed something of significant beauty in viewing your photos as well as reading your journaling. How exquisitely lovely! Home always feels really good when we are not afforded the luxury of being there often. Thank you for sharing this post! I absolutely love your posts from “home”. After reading them, I feel I’ve been there too! So glad you had a lovely visit. Oh, the food you tasted! Lulu’s toes have touched French soil. And Ireland? Looking forward to seeing those photos too. As always, thanks for sharing. What a wonderful and inspiring post! I am a long time reader of your beautiful and delicious blog, and am always happy to stop here to visit. I will be traveling to France in September for the first time–spending a week in Paris. I hope one day to visit the French countryside. It’s beautiful! How lucky you are to be French! My favorite post to date on your blog. My desire to move to France and open my GF B&B has now moved into a new category. Now it is a MUST DO. Your pictures are gorgeous. The recipe for the Red Current Tartlets is fantastic. This was an enchanting post, and I am overwhelmed by all your gorgeous pictures. I can’t wait to go back to Europe in the fall! Thank you for sharing your beautiful memories 🙂 As I read, I can almost imagine myself inside your photographs experiencing each flavor and vivid image. Glad to see you had a lovely holiday! Your photos are beautiful and little Lulu is growing up to be a pretty little girl! 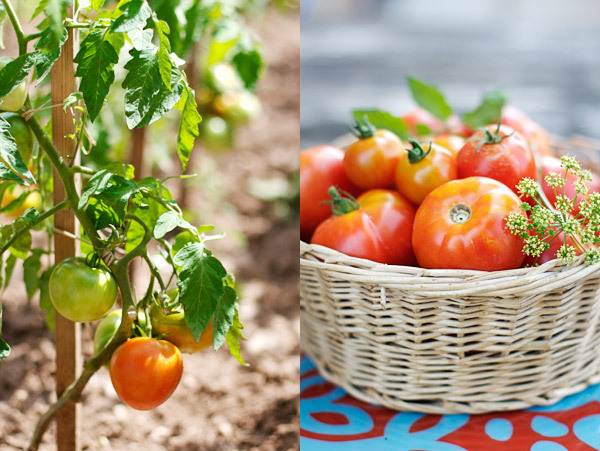 Love the stories of your family’s vegetables and fruits…sounds like a dream! Abd the tart looks delicious! un billet qui fleure bon la campagne et l’amour… j’adore! Your pictures are amazing and the food looks even more amazing. It looks like you had such a great time with your family. Ca sent bon l’Est, la campagne, mon chez moi! Thank you for the intimate loving and peaceful window into your world. I was mezmorized, and for more than a moment, your eye for beauty in the every day refreshed me. Our world is so compelling and beautiful when we take the time to see. Your parents must be very proud of you and particularly thankful that you have grown through their nurturing to the understandings that you have. …my grandmother also always had currants… red, white, and black… Thank you for sharing this place in your heart with me this morning, Bea. What a great opportunity fr your little one to see the place of your birth. You’ve really captured the feel of the places…as usual, absolutely amazing Bea! Your pictures and desserts are lovely! Thank you very much for sharing all these amazing moments with us! I have never *really* been to France (yet! ), but I just have in my imagination with your breathtaking photos and wonderful accounts of your time there. And now begins a tireless search for redcurrants in the Southeast US! Thank you for the beautiful post. J’habite pas loin de ta région natale (en Alsace) et je reconnais bien là tous les paysages, scènes et produits typiques de la région nord-est de la France à cette période de l’année. Tes photos en retransmettent parfaitement la réalité! 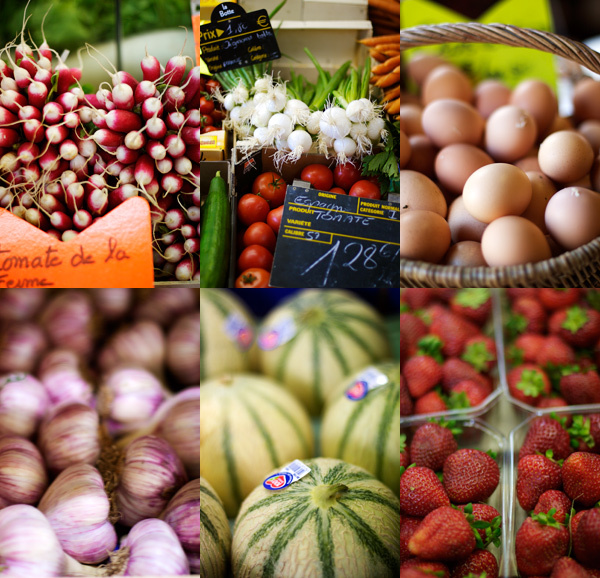 Et que dire de toutes ces recettes! Alléchantes et avec produits de saison, c’est parfait! Les photos des tartes sont tout particulièrement superbes! gorgeous photo array and lovely stories, as always. looks like you’ve given your daughter a really beautiful first visit to france. Your photos are breathtaking and your life, well, enviable! I can’t wait for your book to come out! I always look forward to your accounts of your travels. They are so full of life and impressions, I can almost feel the sun on my face and the wind blowing the fresh hay smell. Thank you so much for sharing this with us!!! you realize how lucky you are, don’t you bea??! and we’re so lucky too..
thank you for sharing your gorgeous life. 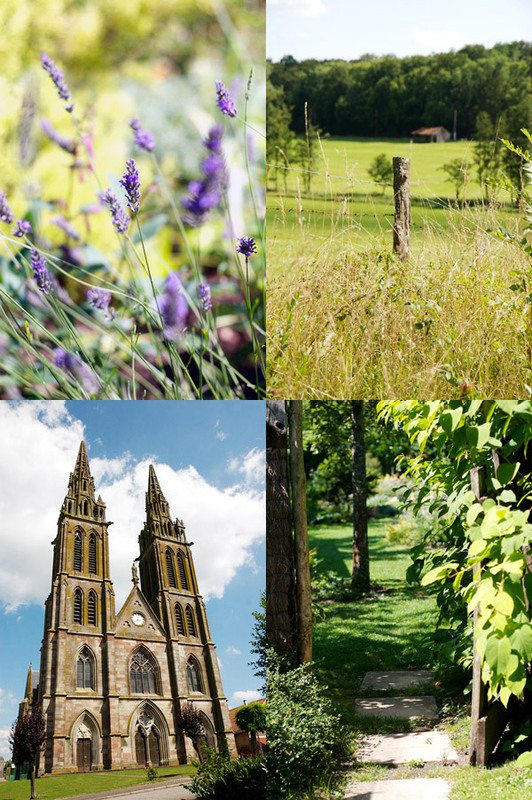 Your photos are absolutely stunning, and it is not even remotely difficult to see why you enjoy being at home so much! 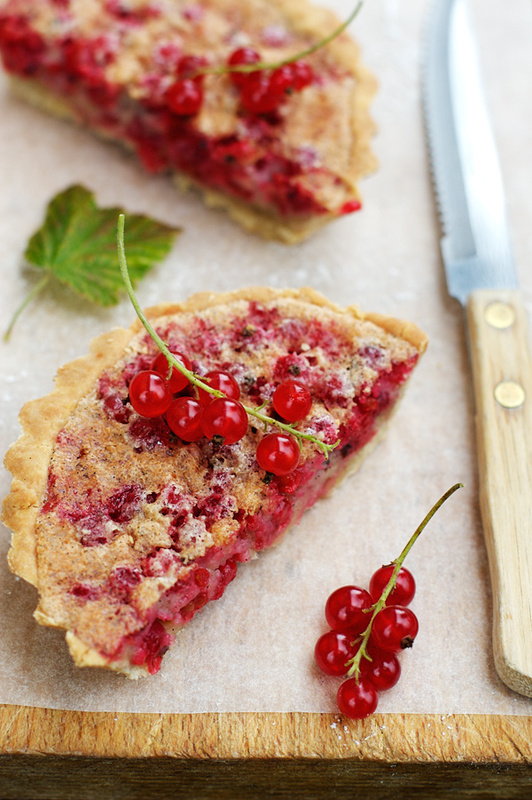 I’ve had my eye on the red currants at the farmers market the past couple of weeks, you’ve inspired me to give them a try with this amazing tart. If only one could escape into a blog post. Simply magnificent. Ces photos c’est comme si on voyait la France des Etats unis. ça fait rêver ! What a delightful post — one of the best posts I’ve read in a long, long time! Loved the words and the photos are just wonderful, inspiring. 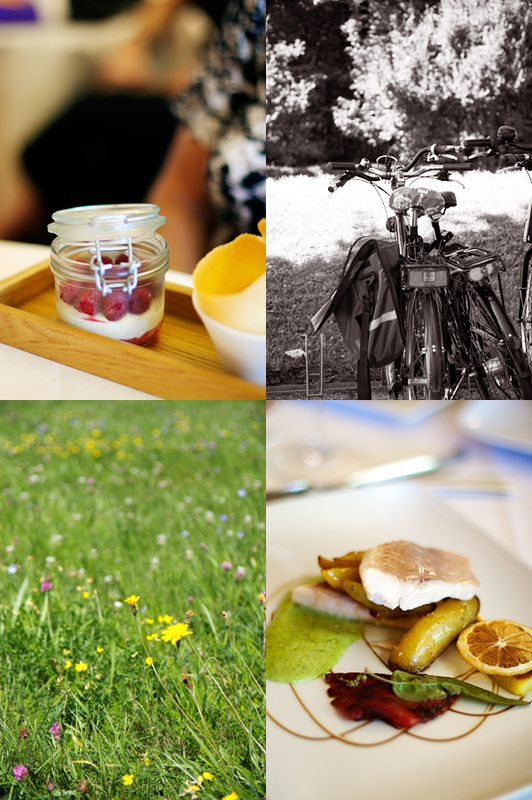 Brilliant pics and a recipe I will definitely going to try…. Beautiful, beautiful shots. You truly have a gift. Makes me miss France sooooo much. Good work! Your post brought tears to my eyes, this is such a moving post..wonderful photos too! How lucky Lulu is , to be amongst this wonderful family. Thank you for sharing with us! How beautiful Bea! You have a rare and amazing ability to provide nourishment for the stomach, the eyes, and the soul all in one fell swoop! What a blessed child Lulu is to have such a wonderful introduction to the world around her. I love all the images but the little snail is especially adorable. Love the attentive eye. All those stunning photos deserve to be in a book. I could imagine myself flicking through it endlessly, dreaming of a French summer of my own. Just beautiful. Just wonderful. What an eye you have. Spectacular. Thank you for sharing! What a beautiful post with such gorgeous photos! It’s making me crave Europe; and risotto! Will you share your recipe? 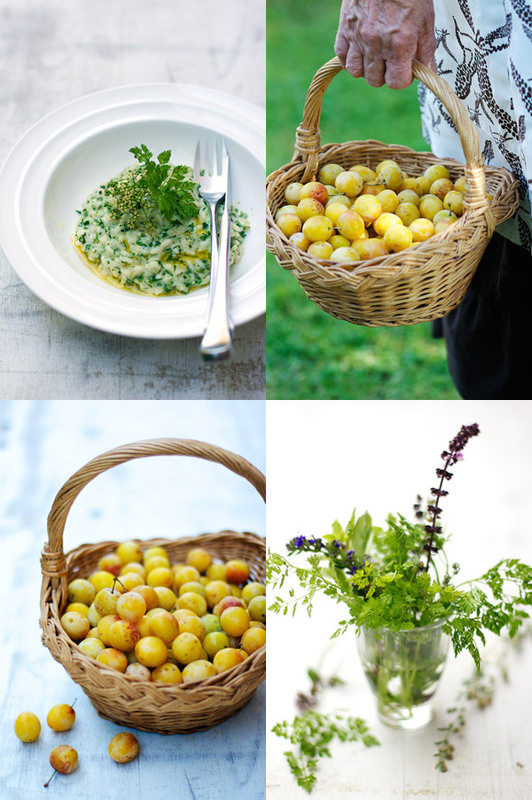 Do you have any recipes for mirabelle jam? A friend of mine has a tree that has been dropping its fruit, and my husband and I gathered a whole bag full of them yesterday! I am not sure what to do with them all. 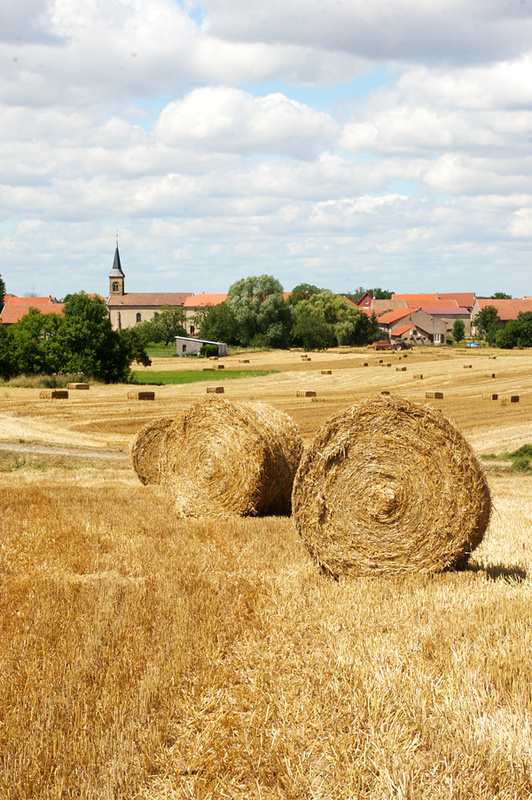 Thanks for sharing your beautiful photos… it makes me miss the fields around Taize and Cluny from when I visited! I love, love, love, love, love your pictures; they are magestic; I can watch them over and over and over. And Lulu is getting so big! Looks like you had a great time back home. fantastically beautiful! i think everyone who reads this post may want to move to france and live that life! Such incredibly beautiful sentiments and photos. How lucky your daughter is to able to visit such an incredible place and know she has a loving family there. I don’t know about the other readers, but I, for one, would like to board a jet plane tomorrow. Merci de nous montrer ces photos de chez vous. 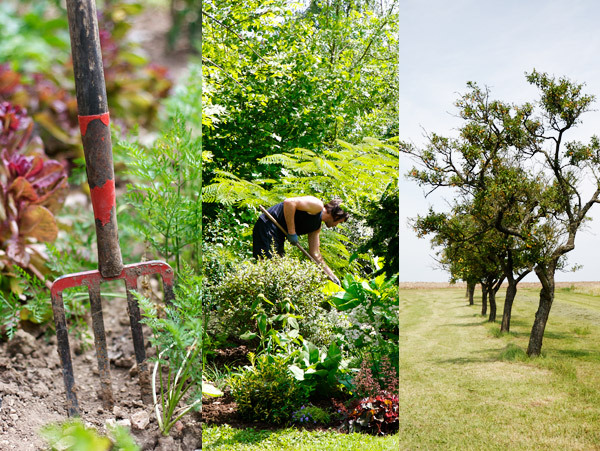 Le paysage, les fruits, les tartes: quelles merveilles! 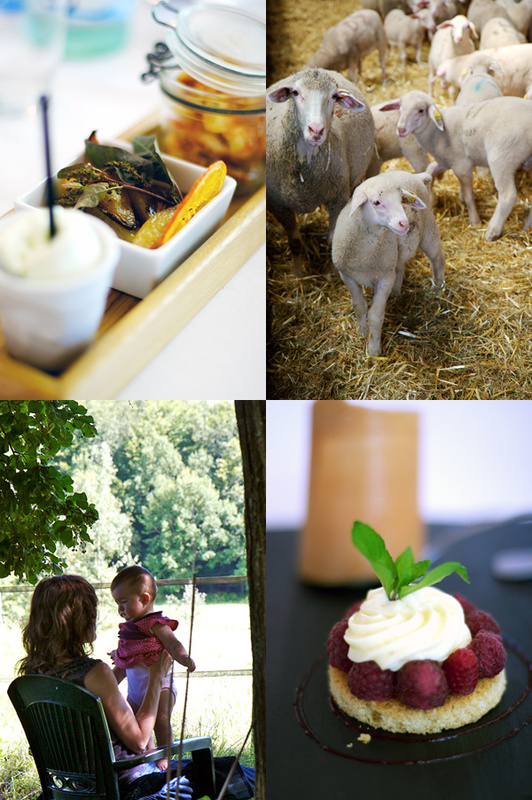 Such a beautiful post and sounds like a wonderful trip – thank you! this is by far the best blog i know of it’s kind. amazing pics. this post is truely breathtaking. wow, i love the summer in france. it’s so pcturesque. as an israeli blogger dealing mostly in food and wine, i can recommend this one to all. great stuff.! beautiful! 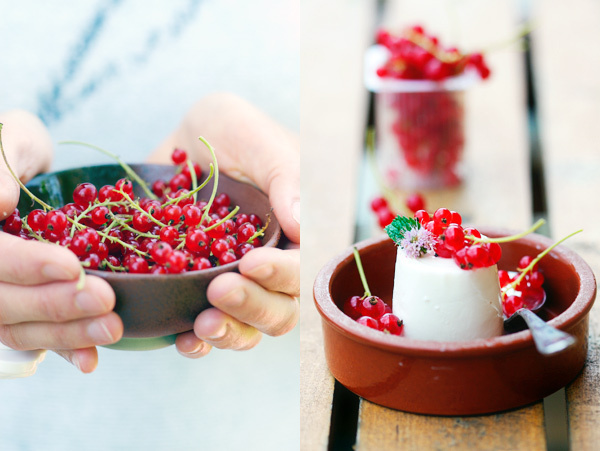 i’m bookmarking these currant ideas for next year because my boyfriend’s mother (who lives in Orléans) had so many red, pink, and black currants this year we ran out of ideas before we ran out of currants! Je déroule, je déroule, affamée par les photos toujours aussi parfaites, les couleurs, les fruits, la main ridée, la frimousse, tout. C’est beau la France oui, c’est beau cette façon aussi d’en profiter! Tes photos sont réellement magnifiques… que d’odeurs et de souvenirs s’en dégagent! Merci d’avoir si joliment representé notre beau pays, plein de sérenité et de luminosité ! Oh my…I love France with all my heart and your photos have just reminded me why. I lived there for a year and thought it was the most delightful place. It looks like a trip well enjoyed…. your blog is always full of wonderfull photos and recipes, bur this time you outdone it ith those picas and history. Oh. how I miss France.There is a long time I travelled through France, but it will bealways in my mind. merci beaoucup for sharing your awesome summer there. Quelles magnifiques photos de cette belle France, pays de nos ancêtres! J’ai bien l’intention de faire ces tartelettes aux groseilles rouges, il y en a encore chez ma fille. Bea, Thank you for sharing these magnificent photos with us. I feel as if I’ve gone on the trip with you! What a beautiful memory. Also, it was a pleasure to make your acquaintance at the styling conference in Boston. I was so happy for you and loved seeing your presentation. Your work was some of the most inspiring that I saw all weekend and I love your recipes. Thanks again for sharing your joys with us. It is a wonderful gift. I love looking at your photos! They are amazing each time! Your website is awesome and i m hooked on it checking it out every single day! Thank you for sharing your beautiful photography skills! May i asked what camera you use for your pictures? Thank you once again and for getting me hooked! Lulu will definitely indeed be one of the happiest and lucky child ever to have such a wonderful childhood! J’habite a l’exterieur d’un village qui s’appelle Whitehouse dans l’ohio,mes enfants 25,22 et 20 sont bilingues vu qu’a la naissance je leur parlais en francais et mon mari en anglais,pour les 2 derniers il faut que je me batte constamment ! quel est l’equivalent de mirabelles,quetsches en anglais?je suppose que les prunes de cochon sont violettes et ovales et on peut en faire de l’alcool ?ou puis-je trouver de l’ail rose ici ?et le melon de cavaillon,j’ai trouve ici le tuscan melon,as-tu une autre idee ? 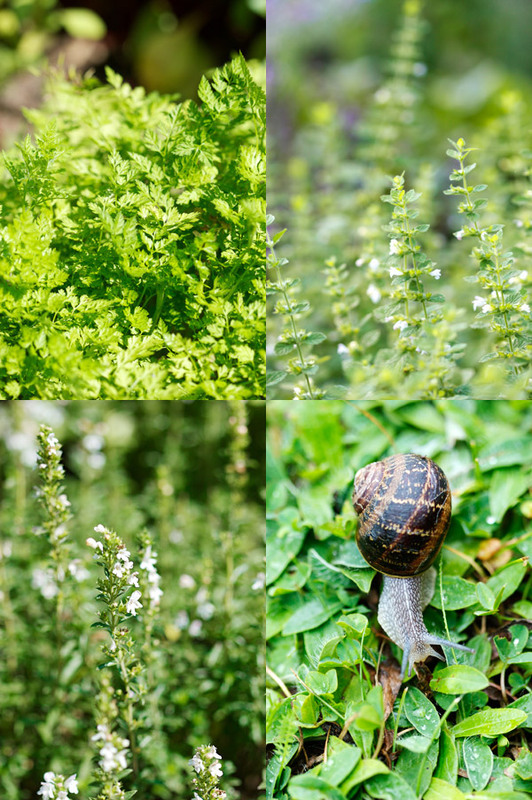 Tes photos sont splendides,quel appareil de photo utilises-tu?l’escargot me rappelle quand j’etais chez mes grand-parents dans l’aube,on allait ramasser les escargots de bourgogne au petit matin apres la pluie et ma grand-mere les preparait apres les avoir fait degorger sous des pots pendant 15 jours,c’est un procede tres long dont je ne me rappelle pas tous les details,j’avais peut-etre 14 ans et les coquelicots sauvages,j’en ai trouve dans le michigan au siege social de toyota,il y en avait des tonnes mais impossible de s’arreter pour en cueillir mais j’ai pris des photos! 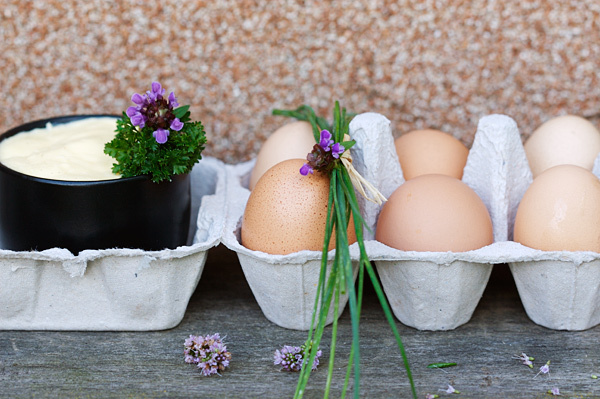 la photo avec les oeufs ,les fleurs et est-ce que c’est de la creme fraiche dans le pot noir ? J’ai eu la chance de parcourir beaucoup de pays quand mon fils aine avait 3 mois,je suivais mon mari pour son travail,2 ans en asie,la nouvelle zelande,l,australie et j’en passe ! how breathtaking! I just had to stop pretending to work so I could show my co-workers your beautiful post!!! Thanks so much everyone for your kind words. Merci beaucoup à tous pour vos commentaires très sympathiques. Cela me touche ! For the mirabelle jam, I would use 1 kilo of fruit (without pits) and 80% weight sugar. Cook for about 30 minutes. Then mix and place in jars. You can sterilize it then (if you like, I typically don’t), or preserve as you would any other types of jam. Christine, dans le pot noir, c’est du beurre. Les mirabelles, il n’y a pas d’équivalent car c’est un fruit local, typique de la Lorraine. Pareil pour les quetsches, bien qu’en fait, en anglais, on dit souvent Damson, mais je trouve que c’est encore différent. Bravo pour les voyages et les langues. L’ai rose, au marché, ou chez Whole Foods, parfois. Quant au melon, j’en ai aussi déjà trouvé à Whole Foods. L’appareil, c’est un Canon 30 D.
Thanks again everyone. Going back to Boston soon! Seeing your photos almost makes me cry. I love France so much and have not been back in 5 years. Next summer I turn 40 and I have long told my husband that what I wanted to do for that big birthday was to fly to Paris and buy copper pots. He did some work in Cannes this past June and thought I would love it, so we are tacking that on too. Only one more year until I can practice my French again. Thanks for the reverie. It’s always a delight to see your photos, they are so beautiful that make me wonder to visit France once more. Gorgeous work! The photogrpahy is stunning- I feel as though I have been transported to France. 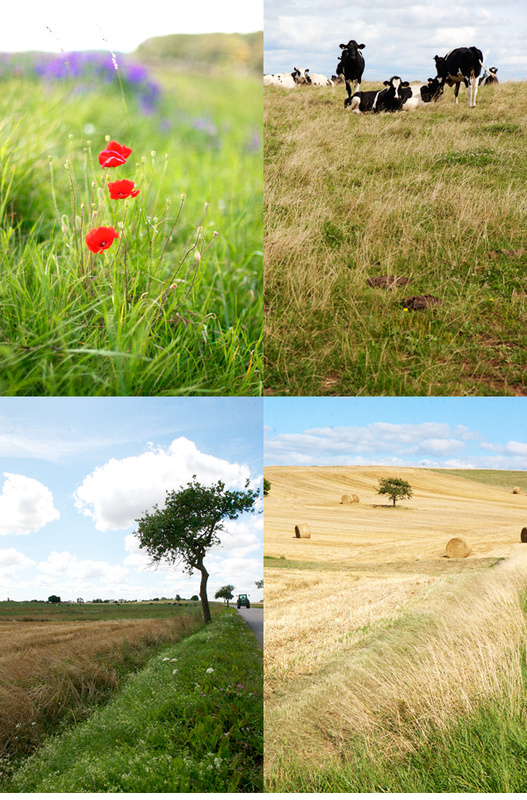 I agree, the photos are wonderful, makes me want to run back to the French countryside. The photos are absolutely beautiful… well deserved break for you! Thank you Bea-I feel like I was there too! 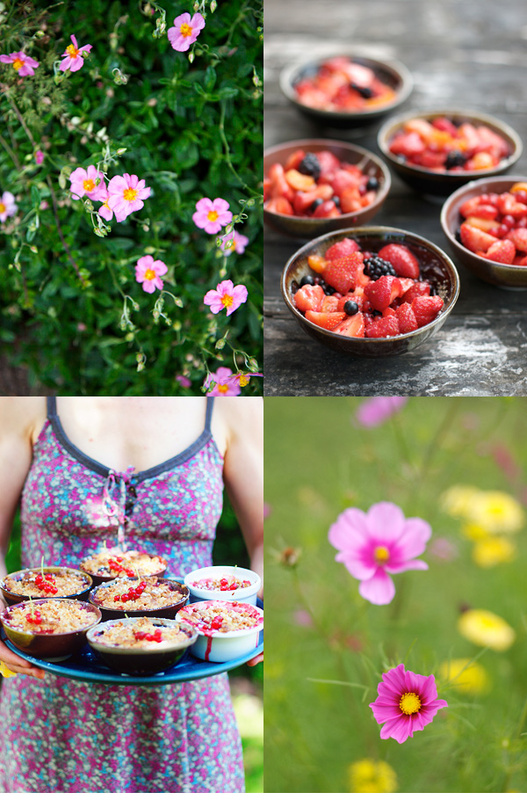 You bring such simplicity and joy into your posts and often remind us of the beauty in nature and food. I just picked up some red currants and was looking for a recipe….I will have to try this one. Thank you so much for sharing such beauty! Beautiful post! 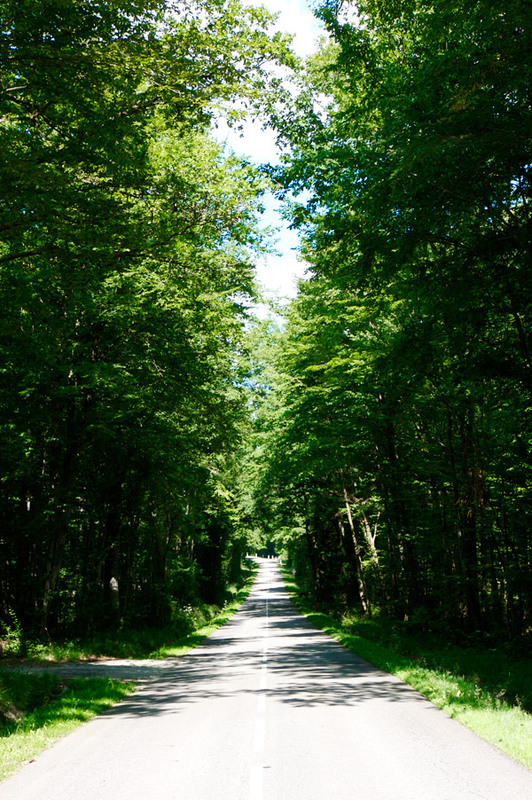 Your pictures are gorgeous as usual and it sounds like you had a wonderful, relaxing trip! Absolutely stunning! I always enjoy your posts so much and relish in the wonder of your pictures and travels. Oh how I would love to go to Europe someday and take hundreds of pictures. My grandma made currant jelly one time and it was absolutely the best. I love the sweet/tart taste of it. I wish I could find them here in Las Vegas. What kind of lens do you use for your wide landscape pictures? Is there one you would recommend for a canon rebel xsi for a beginner? Thank you for such a wonderful post, so pure and true, brings me back to the essence of life. Your photographs are so breathtaking. Thank you for sharing all you travels and great food. What a wonderful post! 😀 Thank You for sharing!! You’re lucky to have such a beautiful home town with gorgeous fruits and veggies.. such a breathtaking place.Thanks for sharing with us. your tartlets sound delicious, of course. i’ve been a reader for a while, but i just wanted to say that i think i love your travel photos the best of all your work!! C’est définitivement superbe ! bravo…que veux tu dire d’autre devant ces photos qui font rêver ! So lovely I just want to jump into the web page. I love your blog and just signed up to receive it by email so I don’t miss anything. I’m crazy about anything French since we visited a couple of years ago. I’m looking forward to your posts. I love your photos… they inspires a lot of poetry. 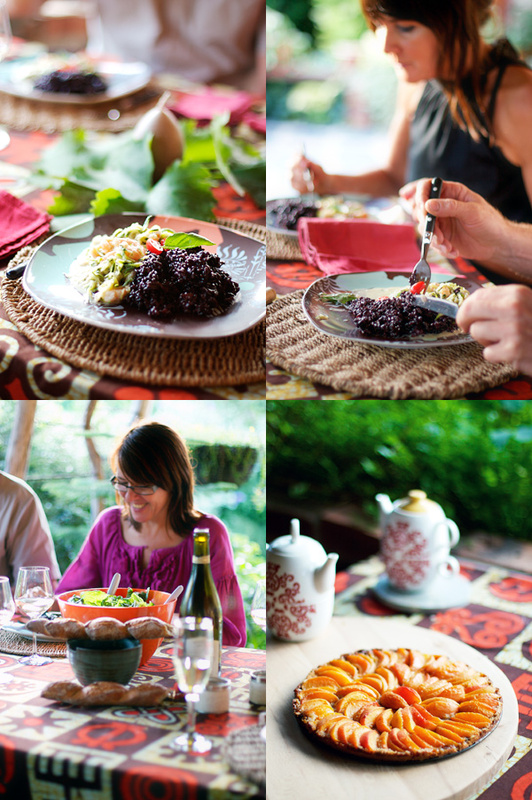 the beautiful writing, photos, recipe, food made up for the long wait for your update. Definitely one of the to-die-for posts! so wonderful 🙂 makes me wonder can life get anymore delicious than this? so beautiful! Just nurtures the spirit to look at it – Thanks! Ah que oui, elle est belle notre jolie France…. Gorgeous, gorgeous post! It was a joy to go through all the photos one by one and back again. I love how you manage to capture the spirit of the place! I didn’t know that red currants where not so common on the US. In Holland they are also very normal, so I am used to having them around. Sigh…beautiful, beautiful, as always! Thanks for the virtual trip. i’ve been coming to this blog for the past year and i have yet to comment. better late than never, but it’s only fitting that i comment on this particular post because it is absolutely breathtaking! keep up the good (and obviously very hard) work! oh, Mes belles Madame Tartine et tartinette (aka, Lulu), je suis presque en *tears*!. It made feel homesick, Mon amour, il est d’Aix and that’s the way we spend our summers over there except for the Lulu part which we haven’t enjoyed yet. Superbes photos, merci de partager ces douceurs au goût nostalgiques. J’ai repensé à ces groseilles volées et ces conduites de tracteur à la nuit tombée. Peut être que Lulu appréciera de “faire le miel” dans quelques années ! Great photos. It looks so beautiful. Plus the food looks very delicious. You’ve got a wonderful blog. Have a good week. All I can say is it took my breathaway looking at those beautiful pictures. You brought me back to Turkey and how I grew up. Truely the pictures looks amazing and the food even more delicious. Good to hear you rested, ate and had amazing time…Beautiful!!! oh my goodness! your pictures are stunning! How could you possibly stand to move away from such a beautiful home? I think if I were from a place like that, I’d never want to leave! How I love your pictures! Are you near Strasbourg? My best friend lives there (though I’ve never been to Strasbourg) and I keep promising to visit. . . Many many thanks everyone. As all things good, the vacation is now over….until next year. Same place, same time…routines like this are a must, no? I was completely transported by your words and photos. Thank you for my five minutes in the French countryside. i can’t believe how beautiful each and every photo is. i could sit here for days staring. please start your food and travel magazine soon so i can curl up with a hardcopy and thumb through it all day long. Beautiful photos! Especially that first one with the hay rolls. I didn’t realise you couldn’t easily get red currants over here. What about white and black currants? They are certainly readily available in England, where I lived the past five years before coming here. I made black currant jam last summer. I like white currants the best – a bit more unusual but so delicately flavoured. Great with poached salmon. Gorgeous. I have subscribed to your blog, long ago, but all too often I don’t get notification. I hate to miss anything. When i saw the photos, i thought my village in Turkey. All village same 🙂 Thanks for photos and tartlet recipe. This is the most beautiful post (and the blog) I’ve ever seen! No more words. Hello – I hope you are well. I found your post and pictures so inspiring that i have named an upcoming fragrance in my collection “Lulu in Provence” after your exquisite post. 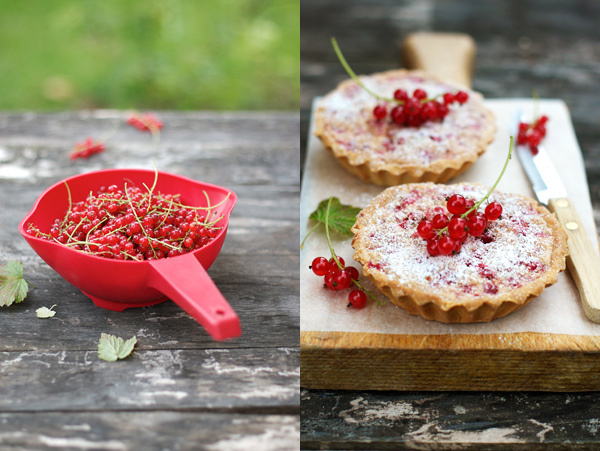 The fragrance is totally inspired by your redcurrant tarts! Although i have designed it with a sandalwood base. i take inspiration from travels and from my childhood trips for my collection and when i saw this post I simply had to remove one of the fragrances in my Rouge line and replace with this beautiful story. There is already a high profile British Magazine writing about it in their May issue although i am forbidden to say which! Anyway, i have now followed you on Twitter and thank you for the inspirational post. Bea, I discovered your blog several months ago and it is still the most beautiful inspiring thing I read. The kitchen was once a foreign place to me, but I started spending more time there soon after discovering this site and now my kitchen is my absolute favorite place to be! I’m even starting my own food blog to document my culinary experiences and discoveries. I only hope that someday my blog can be as lovely as this. I only just stumbled across this post while wondering what to bake this afternoon. 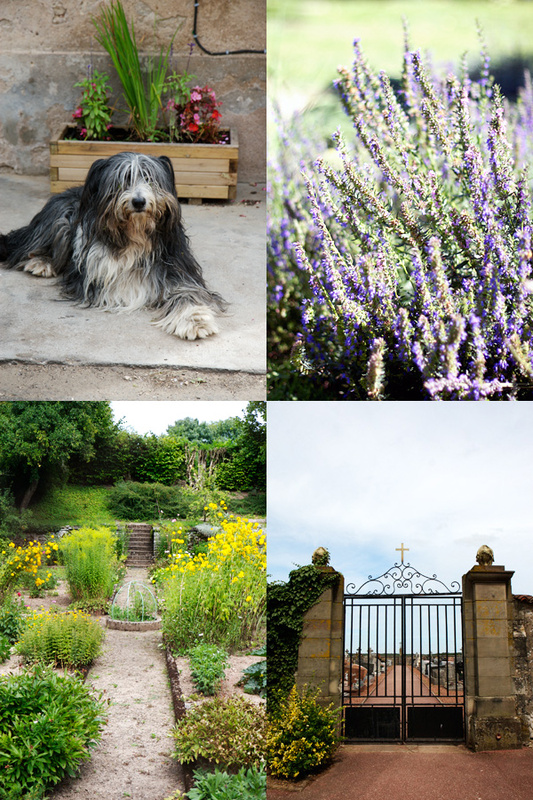 As a hopeless francophile with a desperate wish to move to France, I must say that these photos look like heaven to me. Perfection. Love it. Thank you for this post and this lovely site! J’ai vu l’émission “Envoyé spécial la suite” qui consacrait un reportage à votre blog “La Tartine Gourmande”. J’ai ainsi découvert votre blog et je tiens à vous dire que c’est très beau (et sûrement bon!) ce que vous faites! Par ailleurs, j’ai eu la surprise de voir que le post évoquant vos vacances en Lorraine occupe une place de cœur pour les blogueurs. Mais quand on voit les photos et le texte que vous avez sélectionnés, on ne peut que rester bouche bée! Très beau témoignage à la gastronomie et aux paysages de notre belle région qu’est la Lorraine! Merci et bonne continuation! Very lovely moments, thank you for sharings! Beautiful life …. Red currants are hard to find in the US because they carry White Pine Blister Rust (http://en.wikipedia.org/wiki/White_Pine_Blister_Rust), and have been effectively banned since about WWI. They’re my favorite food discovery in Europe. I just found your recipe now years later and made your redcurrant tart, but as one large one rather than several small ones, from the first harvest of the year. It was delicious and loved by all! And gluten-free to boot. Divine! Wow, gorgeous!! 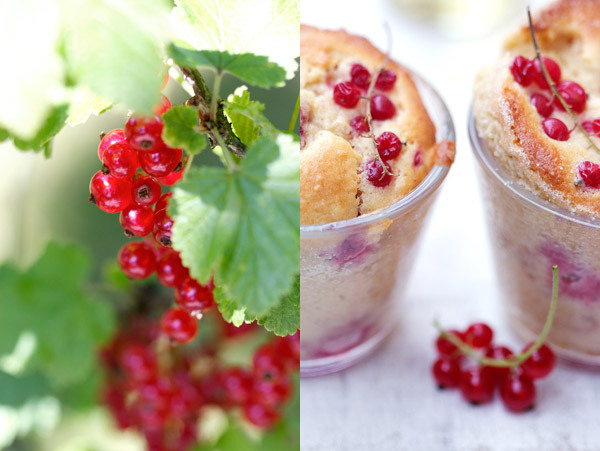 Do you have the recipe of those red currant muffins in a glass? I love them! !